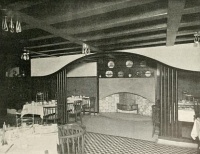 Mackintosh carried out two phases of work at Miss Cranston's 'Crown Lunch and Tea Rooms' in Argyle Street. In 1898 he designed furniture and light fittings associated with George Walton's interior scheme following the remodelling of the entire building by architects H. & D. Barclay; in 1905–6 he returned to remodel and decorate the basement, creating the Dutch Kitchen. Alternative names: Crown Lunch & Tea Rooms. Status: Standing building; Dutch Kitchen interior partly extant but concealed. 1: Studio, 39, October 1906, pp. 31–6.